How to get insurance when unemployed 6 years ago Guest post byÂ Marius. Many thanks, Marius! 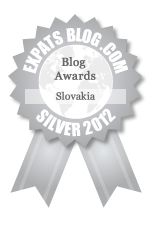 ExpatsBlog.com Expat Blog Awards 2012: Slovakia Silver Award! This blog won the Silver Award for best expat blog in Slovakia! Nice blog - for an inhabitant of Slovakia, just a different angle of view. quite funny.